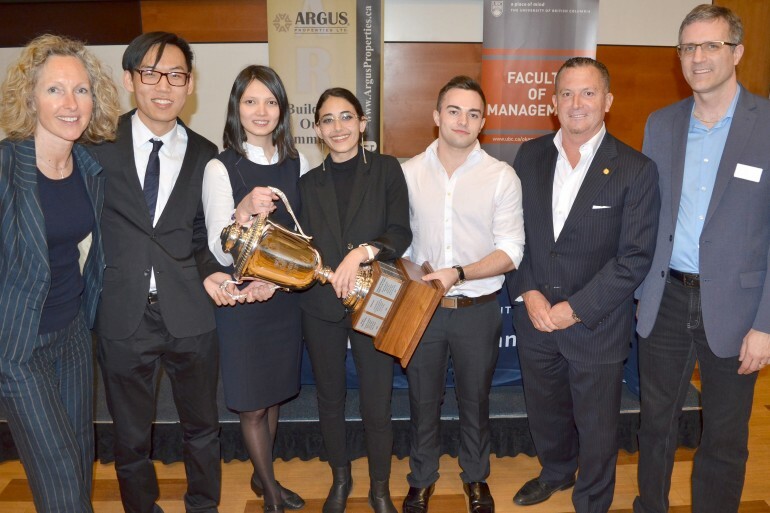 From left, lecturer Svan Lembke, David Gao, Stehaniya Mikhaylova, Marisa Matthews, Dan Thornton, Argus Properties President Ted Callahan and Faculty of Management Director Mike Chiasson celebrate with the Argus Cup after the 2018 Live Case Challenge. Aggressive expansion in a region experiencing high residential growth – achieved by purchasing and partnering with an established company to recreate high-end and tailored service delivery that meets contractors’ needs. That was the recommendation in the winning presentation at the UBC Faculty of Management Live Case Challenge held last week. Third-year Management students David Gao, Marisa Matthews, Stehaniya Mikhaylova and Dan Thornton—a multinational team representing Russia, Kenya, China and Canada—took home the top prize in UBC Okanagan’s seventh annual student challenge, which was sponsored this year by Argus Properties Ltd.
Every year, third-year Bachelor of Management students at UBC’s Okanagan campus are challenged to solve a real, or “live,” problem on behalf of an organization based in the region. Students must draw on the knowledge from a wide range of management courses to analyze the organization, research industry practices, and develop a comprehensive presentation with recommendations and an implementation plan. Pro Builders Supply-Home Hardware Building Centre asked students to consider a range of growth opportunities that would build on their present business model and strategy. As a chain of full-line home improvement building supplies, Pro Builders started in Penticton in 1998 and has since grown to include five locations in the Okanagan and in Canmore, Alberta. The company is part of the Home Hardware network. The winning group proposed that Pro Builders focus on expanding operations into a region experiencing significant growth and new building starts. Students identified a potential company to acquire and proposed they build on existing strengths with additional customer service programs. Their analysis and projections showed the recommendations would help Pro Builders outperform the competition in the new region within three years and grow its footprint in Western Canada. Live Case Challenge is a partnership between UBC’s Faculty of Management and Argus Properties Ltd. The partnership delivers on the shared commitment to collaborate with organizations throughout the region and develop flourishing and sustainable organizations, businesses and communities. The winning group receives the Argus Cup and a $5,000 award. “Argus is proud to support the community, education and what UBC’s Okanagan campus means to the entire region. It’s really exciting to see the opportunity the students have to learn from a live case that’s local. They are the future of the Okanagan, and we congratulate all the students for their efforts,” says EJ (Ted) Callahan, President and CEO of Argus Properties.